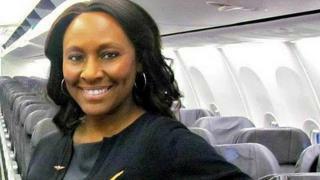 When Shelia Fedrick saw a dishevelled girl sat beside an older, well-dressed man on her flight, she was concerned. The teenager “looked like she had been through pure hell”, the flight attendant told NBC, and the man would not let her speak to the girl. Ms Fedrick left a note for the girl in the plane’s toilet – enabling the girl to explain that she needed help. It turned out the girl was a human trafficking victim – and Ms Fedrick’s instincts had helped to save her. The pilot was able to inform the police, who were waiting when the plane landed. The 2011 incident on Alaska Airlines was reported in US media this week, as charity Airline Ambassadors seeks to train airline staff in ways to combat human trafficking. Airline Ambassadors’ website says a trafficking victim may appear afraid of uniformed security, unsure of their destination and nervous. They may also provide scripted answers, and be wearing clothing unsuitable for their destination. Traffickers, meanwhile, might answer questions for the victim, observe the victim persistently, and may not know their name or personal information, Airline Ambassadors added. Instead, Airline Ambassadors tells flight attendants not to confront anyone or display unusual concern or alarm, but to get the pilot to radio the upcoming airport. In Ms Fedrick’s case, she managed to communicate discreetly with the girl after whispering to her to go to the plane toilet. She left a note on the mirror for the teenager, who “wrote on the note she needed help”, Ms Fedrick told 10News. The girl is now attending college, and has stayed in touch with Ms Fedrick, 10News reports. According to the National Human Trafficking Hotline, 7,572 trafficking cases were reported in the US in 2016. 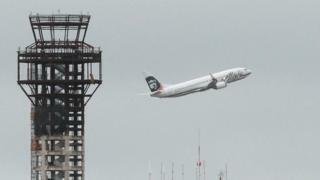 Alaska Airlines did not respond to a BBC request for comment.